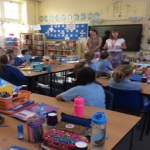 It was lovely to welcome the school nurse in recently. She chatted with the children and discussed the importance of keeping their bodies clean and also about the changes that occur to their bodies as they grow up. The children showed a mature attitude throughout the sessions and were able to have their questions answered in a controlled environment.